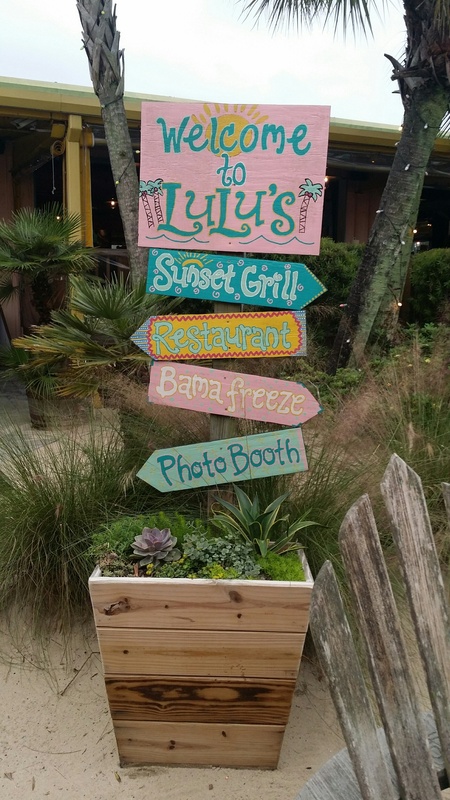 The Travel Voice by Becky crew took a QUIK TRIP to Lucy Buffett’s LuLu’s Gulf Shores, Alabama. We were already in town filming at a prominent resort so we decided to see just how much fun we could have at this restaurant. First of all, with a quick eye scan of the place, it was clear that it was anything but “just a restaurant.” The dining area is both inside and outside and seems to seat a number higher that I could count off the cuff. The band was playing from the LuLu’s stage (there is live music every single day), people were happy to be there and enjoying fresh seafood along with other culinary treats. Outside the folks waiting didn’t seem to mind. That may seem odd to you until you realize how Miss Buffett takes care of them. The wait is part of the fun! There are bars, a sand lot for the kids to play in, a water contraption for kids (fountain of youth), a ropes course (mountain of youth), an arcade, a huge gift shop and games! I think my kids would be disappointed if there wasn’t a wait! Once inside, choose from true Southern comfort foods for an appetizer (think fried green tomatoes or fried okra with ranch dipping sauce). Entrees are plentiful and range from fresh seafood options to a Cheeseburger in Paradise. Special allergy menus are available upon request and offer a lot of options, not just a couple as many restaurants do. And, don’t forget a frozen concoction like a Jet Ski Killer or Bama Breeze…or taste Lucy’s own Crazy Sista Honey Ale! It’s hard to make a bad choice at LuLu’s Gulf Shores! Since the time of this video, LuLu’s Destin has officially opened and is delighting guests daily. Continuing the tradition, there is live nightly music at LuLu’s Destin. Try out the new app to get your name on the waiting list before you arrive. It’s a game changer! LuLu’s Myrtle Beach is coming Spring of 2018 so look out South Carolina! The restaurant will be located at Barefoot Landing in the North Myrtle Beach area. Also, Lucy Buffett’s second cookbook Gumbo Love is now available! From great recipes for Gulf Coast Cooking to entertaining and lovely desserts, this will be a go-to cookbook for fans. Purchase online, at LuLu’s location gift shops, Barnes and Noble, Books-A-Million or Amazon! Check out out short video to see all the fun and frolic happening daily at LuLu’s…this will make your day happier and next time you’re in Gulf Shores, you’ll be looking for LuLu’s!